It is this special time of the year again: We are going back to school. And whether you are a college student or a tenured professor, or anything in between (yay Grad students! ), you might be asking yourself what iPad apps you could download to get the most out of your iPad. 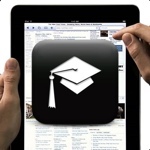 This is my personal list of the 30 best iPad apps for college / grad students and professors. It is not one of these countless posts that list a bunch of generic apps like Safari, Facebook and iBooks. Those are not really specific to people in university, and I also bet you knew those already. I am also not going to throw a list at you filled with niche iPad apps targeted at one particular subject or at earlier years of education. So what will you find here? This is a list of my favorite iPad apps that are useful for everybody in academia – college students, grad students, postdocs, lecturers and professors – because they help us excel in our core workflows: Writing, Reading, Thinking, Presenting and Organizing our academic lives. The iPad apps I am listing here are all high quality, paid apps. For some of these you might be able to find free alternatives, no doubt. However, you get what you pay for, and I think that it doesn’t hurt to invest a little money in quality paid apps that boost our core workflows. Of course, that doesn’t mean that all free iPad apps are worthless! There are great ones for academics out there, and I will publish a post of my favorite free apps very soon (so sign up for academiPad’s RSS or twitter streams). But back to the current post: For each of the core workflows (Writing, Reading, Thinking, Presenting and Organizing our academic lives), I am discussing a couple of iPad apps and how they fit into that workflow. Sometimes I am listing more than one app for a particular use case, so be sure to check out the links to more in-depth discussion of these apps. Distraction free writing: ByWord ($3, iTunes link), iA Writer ($1, iTunes link) and OmmWriter ($5, iTunes link) are apps for distraction free writing. The idea of these apps is to boost your creativity by letting you focus on writing and nothing else. All three are great iPad apps, but they have slightly different approaches to the user interface. Both ByWord and iA Writer aim to make your writing experience as minimalistic as possible. I like ByWords overall look and feel more than the one in iA Writer, but both are totally great apps. OmmWriter is a little different in that it tries to stimulate your senses through smoothing audio and visual effects. OmmWriter’s keyboard on the iPad, for example, is absolutely one of its own kind. Although I am using ByWord for most of my distraction free writing sessions, I will use OmmWriter every time I feel stuck. All three apps also have companion apps on the Mac, and OmmWriter also has a Windows version. Are you intrigued? Check out the more detailed reviews of ByWord, iA Writer and OmmWriter on academiPad to find out what distraction free writing app suits you best. 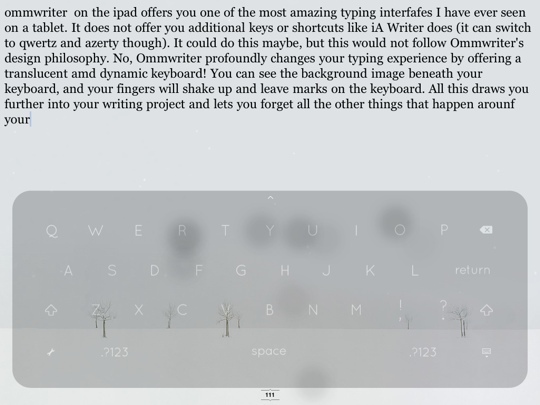 OmmWriter’s keyboard brings something like a haptic experience back to your digital writing workflow. The keyboard moves under your fingers back and forth, and your fingers leave little marks that fade away in seconds. Manage your writing projects: MacJournal ($6, iTunes link) is a great iPad app to organize your writing projects and notes from classes and conferences. Think of it as a database for notes: you can create journals (and sub-journals) like folders in the Mac’s Finder or Window’s Explorer, and everything from a single thought to a draft of a chapter can be put into these journals. This way all your pieces of written information are coherently organized, and you can access them on your laptop or desktop computer via the MacJournal companion apps for Mac and even for Windows. Bonus Tip: You can turn your iPad into the ultimate writing machine by adding an external keyboard. Read in these post why writing with an iPad + keyboard can be even better than using a laptop, and how you find a keyboard case that fits your individual writing style. Format and exchange write-ups: Once your writing projects are (almost) done, it is time to fancy them up a little bit with proper headlines, bullet points and page numbers, so that they can be sent to your professor or peers. And in the reverse, you sometimes need an app to edit documents that are sent to you by others. This is the moment when you fire up Pages ($10, iTunes link) – not earlier! So while I am using ByWord, OmmWriter and MacJournal for most of my writing on the iPad, Pages is my iPad app of choice for finishing up and exchanging documents with co-workers. If you are more at home in the Windows world, QuickOffice Pro HD ($20, iTunes link) might be the even better choice for you. While Pages will work with Microsoft Word documents, QuickOffice Pro HD specifically targets iPad users whose other machine is a PC by offering an all-in-one solution for Microsoft Word, Excel and Powerpoint files. (Structured) Note taking: Everybody has his or her own style of taking notes. If you are the kind of guy who takes structured notes, then ThinkBook ($2, iTunes link) could be for you. With ThinkBook you can organize your lecture notes into bullet points, to dos and question items. It is also great to keep track of your class or research projects, or to take notes during a meeting with your advisor. Your notes can be neatly organized into different books and pages, and you can tag your notes to find them more easily later. The good thing about ThinkBook is that it is the fastest way to jot down and structure bullet lists and action items, as you can easily add new items or arrange items into a hierarchy through gestures or special keys. However, if you prefer to type more lengthy text notes, MacJournal might be a better fit for you. And if you prefer to take free-flow handwritten notes and sketches, you have to check out the “Thinking” iPad apps in the second part of this post (coming soon). Annotate journal articles: In my opinion, you should start organzing your PDF-based journal articles the moment you enter grad school – possibly earlier if your undergraduate program has a research component. Papers ($15, iTunes link) and Sente ($20, iTunes link) are two outstanding PDF management systems that let you organize and annotate PDFs. The best thing about these PDF management systems is that the iPad apps are tightly integrated with the Mac (and in Papers’ case: Mac and Windows) companion apps. The downturn is that your annotations are trapped inside the apps’ ecosystem. However, I am a strong advocate of using either Sente or Papers because this is a small price to pay for the advanced organization and annotation features these iPad apps and their Mac companions offer. You can read more about the benefits of PDF management systems in my guide to annotating PDFs on the iPad. Once you are convinced that PDF management systems are for you, read my Papers vs. Sente post to find out which of the two is the better fit for you. Read and Annotate other PDFs: Even if you use a PDF management system like Sente or Papers, it is a good idea to have a standard PDF reader on your iPad to process files that should not clutter your research database: Committee work, conference programs, call for papers, syllabi and so on. iAnnotate ($10, iTunes link) is my weapon of choice for this, mainly because it was the first one that supported annotations. I has never let me down, but if you want to shop around, you can check out my guide to annotating PDFs for more iPad apps that do essentially the same thing. Read RSS feeds: The idea behind RSS feeds is that you can get updates from your favorite webpages and blogs automatically in one place, without visiting every website by yourself. My favorite RSS reader has been acrylic’s Pulp ($5, iTunes link) for a long time. Pulp mimics the look of a newspaper, which is a great way of browsing through your most important blogs during breakfast, and it syncs with a Mac companion app over the cloud. I also like that Pulp does not rely on Google’s Reader service as almost all other RSS reader iPad apps do. Call me paranoid, but I don’t like to put all my information into one Google basket. Sadly, acrylic announced in July that they would cease developing Pulp. The current Mac and iPad apps are still in good shape, but obviously it is a gamble of whether they will be picked up by someone else at a later point in time. So spend money on it at your own risk. 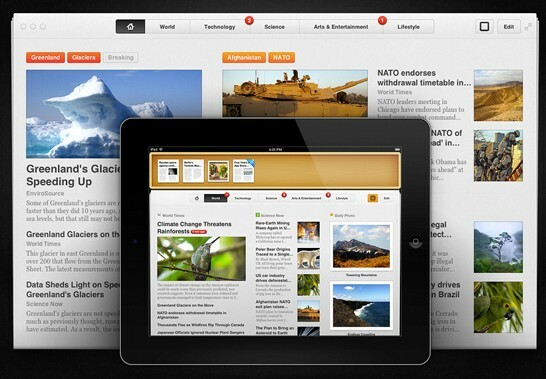 Pulp arranges your RSS feeds in a newspaper format both on the iPad and the Mac. Since acrylic has announced to cease the development of Pulp, I have started looking around what other RSS reader I could use. Reeder ($3, iTunes link) is based on Google’s Reader, but otherwise it looks like a good option to me. It has a simplistic design and also a companion app for the Mac. Also, I think that Reeder’s paper stack metaphor might be better suited than Pulp’s newspaper metaphor to handle large collection of feeds. And last, Reeder has some advanced features that I a missing in Pulp, such as being integrated with Buffer’s tweeting service. I haven’t made the jump over from Pulp myself yet, but if you don’t mind being hooked up to Google for your RSS feeds, then I am sure that Reeder would be a great choice for you. While we are talking about RSS readers: I highly recommend that you add academiPad to your RSS reading list. Its totally risk and money free, and there are five more good reasons to stay close to academiPad. These have been the first 12 of my favorite 30 iPad apps for academics. Read the second part of this post to learn about the other great iPad apps for Thinking (or conceptualizing ideas) and Presenting. The third part of this series covers iPad apps for Organizing and Enjoying academic life. If you liked the first 12 iPad apps, please let your peers and the whole world know about them by sharing this article. Disclaimer: OmmWriter image by academiPad, all other images by respective developers. This article contains affiliate links. Please consider sharing this article if you found it useful. I find it is really helpful post. Thanks for your time. I notice that you don’t mention My Writing Spot, which has replaced IA Write in my iPad writing toolbox. Apart from a better user interface and keyboard, My Writing Spot syncs your texts on the Mac, Windows and Android platforms (I often work on the same text at different times on my iPad and on my Samsung Galaxy III Android smartphone). Google Drive is also a useful app for cross-platform text writing. I noticed you didn’t include a speed reading app on the list. Learning to speed read made college considerably easier and has really helped me in my career. I know and used a speed reading app on the Mac. Do you have an idea for the iPad? For writing, I use WriteRoom in combination of Scrivener on Mac. I like the range of its customization! For reading, I’ve been using GoodReader: I thinks its interface is easier to use compared to other similar apps. And For RSS, I use Reeder on my Apple devices! (And yes I have your blog feed on it hehe.) The iPad version need more functions compared to its iPhone and Mac versions, but its simplistic is suited for reading through a bunch of feeds. Nice choice of apps there, Masaki! I am slowly switching over to Scrivener, lets hope they will bring out an iPad companion app soon. Experiment failed… am I doing something wrong that I can’t see your reader comments? Good start, though I thing it would have been better had you done the whole thing – sharing all 30 of your favorite apps – rather than 12. Also, the date line says you have 36 comments on this post, but I’m unable to see them. Often, I learn as much in comments as I do on the post itself, so I’m commenting to see if it then allows me to read the comments. That aside, good blog and good info (though the tweet/fb like/g+ share floating button on the left obscures some of the text).